Who invented the Computer? The name of the person credited with inventing the Computer is Charles Babbage (26 December 1791 - 18 October 1871). Charles Babbage is not only famous as the English inventor of the Computer but also as a mathematician, philosopher and mechanical engineer. When was the Computer invented? Charles Babbage invented the Computer in 1837, during the early Industrial Revolution period of invention. The invention of the Computer originated in England and is considered a major achievement in the field of Computing and Technology. Definition of the Computer: The Computer is defined as a programmable electronic machine or device that that performs (computes) high-speed mathematical or logical operations or that assembles, stores, correlates or processes information. Fact 1: Who invented the Computer? The Computer was invented by Charles Babbage in 1837 during the Industrial Revolution era of inventions and was a profound addition to advancements made in the area of Computing and Technology. Fact 2: Who invented the Computer? Charles Babbage invented the first mechanical computer, a steam-driven calculating machine that would be able to compute tables of numbers, and originated the concept of a digital programmable computer. Fact 3: Who invented the Computer? 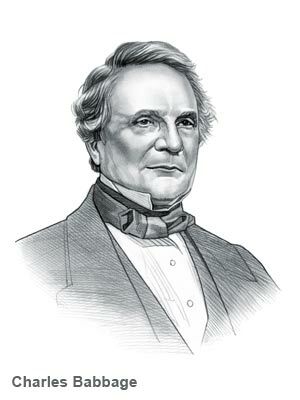 Charles Babbage began the road that would lead to the development of the modern computer however, earlier contributions of other inventors should not be forgotten. Fact 4: Who invented the Computer? History of the computer began when the Mesopotamians invented the Abacus in 2400 BC and Pingala invented the binary number system in 300 BC. In 1614 John Napier invented a system of moveable rods (Napier's Rods) based on logarithms which was able to multiply, divide and calculate square and cube roots. In 1642 Blaise Pascal invented the "Pascaline", a mechanical adding machine and in 1801 Joseph-Marie Jacquard invented an automatic loom controlled by punched cards. Fact 5: Who invented the Computer? Charles Babbage followed in the footsteps of these great inventors from history and invented the mechanical Computer. Charles Babbage, was born on 26 December 1791 in London, England and died on 18 October 1871. Fact 6: Who invented the Computer? Charles Babbage was born to wealthy parents Benjamin Babbage and Betsy Plumleigh Teape at 44 Crosby Row, Walworth Road, London, England. He was raised with his family of four brothers and received an excellent education at top schools and with home tutors. Fact 7: Who invented the Computer? Charles Babbage completed his education in 1814 at Trinity College, Cambridge and Peterhouse, Cambridge, where he studied mathematics. Fact 8: Who invented the Computer? In the same year, 1814, he left Cambridge he married Georgiana Whitmore. The couple had eight children, but only three survived childhood. Fact 9: Who invented the Computer? In 1816 Charles Babbage was elected a Fellow of the Royal Society and founded the Astronomical Society and went on to found the Analytical Society with John Herschel and George Peacock in 1820. Fact 10: Who invented the Computer? Work on his invention of the Computer began in 1821 when he started to develop the Difference Engine which was intended to compile and print mathematical tables. His work on the Difference Engine would ultimately lead to his invention of the Analytical Engine in 1837, the first mechanical general-purpose computer. Fact 12: Who invented the Computer? 1827 was a terrible, tragic year for Charles Babbage with the loss of his father, his wife and a son in the space of just 12 months. He threw himself into his work and returned to Cambridge. Fact 11: Who invented the Computer? From 1828 to 1839 Charles Babbage was employed in the esteemed position of the Lucasian Professor of Mathematics at Cambridge. He continued his work developing the Difference Engine. Fact 12: Who invented the Computer? The invention of the Computer was beset with financial difficulties which came to a head in 1832 when the government withdrew the funding for his project. Fact 13: Who invented the Computer? Charles Babbage started work on the Analytical Engine in 1833 and his aim was to invent a machine that would perform any mathematical task. Fact 14: Who invented the Computer? Charles Babbage completed his design of the Analytical Engine in 1856. He used the punch card idea that had been invented by Joseph-Marie Jacquard in 1801 for programming. Fact 15: Who invented the Computer? Charles Babbage died on 18 October 1871 in Marylebone, London. His name is assured in history as the inventor of the computer. Fact 16: Who invented the Computer? In 1878, after the death of Babbage, a committee of the British Association for the Advancement of Science described the Analytical Engine as "a marvel of mechanical ingenuity". But the prestigious committee refused to fund the project, unsure of how much it would cost and whether it was perform accurately after it was built. Fact 17: Who invented the Computer? Charles Babbage was never able to fully complete the construction of his Analytical Engine due to lack of funding. The actual building of the first general-purpose computer would not occur until one hundred years later in the 1940's. The proposed structure of Babbage's Analytical Engine has dominated computer design in the electronic era. Fact 18: Who invented the Computer? The development of the modern electronic Computer started during WW2 (1939 - 1945) when Alan Turing invented the electromechanical Turing Machine. In 1958 Jack Kilby and Robert Noyce invented the computer chip and the first Internet, called ARPANET, was developed in 1969. In 1971 Ray Tomlinson invented Email and between 1974-1977 the first personal computers were developed. In 1976 Steve Jobs and Steve Wozniak founded Apple, pioneering the development of the Personal Computer, leading to the development of the iPad and the Smartphone. Adam Osborne invented the Laptop computer in 1981. The English inventor Tim Berners-Lee invented the World Wide Web in 1991 and in 1998 Sergey Brin and Larry Page invented the Google search engine. Fact 19: Impact of the Computer? The invention of the Computer made a profound effect on the lives of people and a massive impact on society. The computer is the most versatile machine that has ever been invented and computers are used in nearly every business and industry, changing the jobs of many people. Space ships, planes, cars and practically every modern household device have been designed via computers. Education has taken huge leaps due to readily available information via computers and entertainment such as the movies have benefited from special effects created by the computer. For additional information refer to the Invention of the Personal Computer.